I can hardly wait for Adelaide Festival this year. The entire programme looks incredible and I almost can’t believe that I have the great honour of performing some works by John Zorn with ELISION. This entry was posted in Past Events and tagged Recitals on February 5, 2014 by Liz. 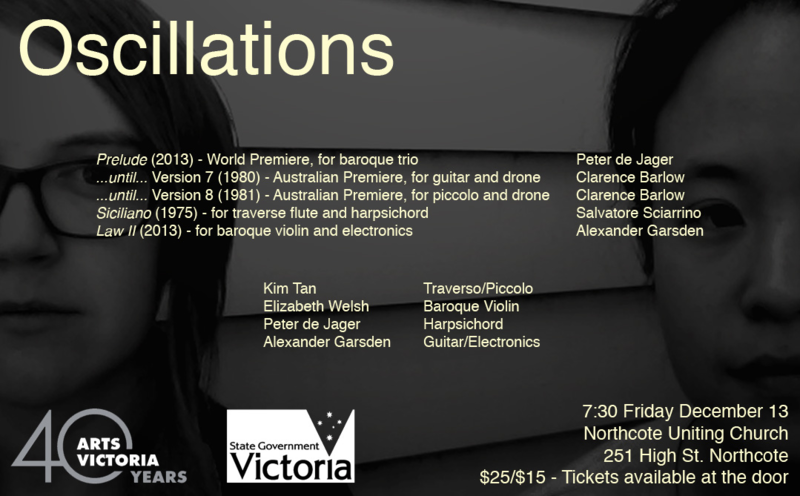 With thanks to Arts Victoria, Kim Tan and I will be co-producing a concert series over the next few months. The first show will be on December 13th at Northcote Uniting Church featuring new music for period instruments and electro-acoustic works. This entry was posted in Past Events and tagged Recitals on November 21, 2013 by Liz. This entry was posted in Past Events and tagged Recitals on October 10, 2013 by Liz. 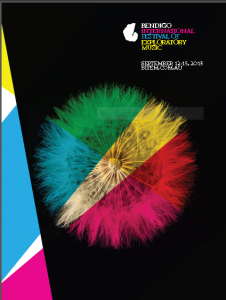 I have the pleasure of presenting a recital in the inaugural Bendigo International Festival of Exploratory Music this September. The festival all looks amazing and I strongly encourage everyone to come and see what it’s all about. I’ll be playing the Sciarrino Sei Cappricci as well as two new pieces by Alexander Garsden and Jeanette Little for baroque violin. The show will also feature an electronic work by Sergio Luque. This entry was posted in Past Events and tagged Recitals on September 12, 2013 by Liz. This entry was posted in Past Events and tagged Recitals on August 15, 2013 by Liz. This entry was posted in Past Events and tagged Recitals on October 14, 2012 by Liz. With the generous support of the City of Melbourne, Judith Hamann and I are very excited to co-produce Metapraxis in association with Arts House. Jon Rose will be joining us along with an ensemble of our dear friends and colleagues. This entry was posted in Past Events and tagged Recitals on July 18, 2012 by Liz.